Earl Norem sadly passed away last Friday at the age of 91. While the fabled Conan artist made plenty of waves with his work on 80's toy franchises Transformers and Masters of the Universe (of which I had plenty of books of), the part of his legacy that resonated strongest with me were his Big Looker Storybooks Fantastic Four: The Island of Fear and The Amazing Spider-Man: The Big Top Mystery. He was the first artist I ever remember noticing had drawn a variety of my favourite books as a kid. Not Dr Seuss, and slightly before Bill Peet was Earl Norem. So much so, both the Marvel books were released in 1984, and both are still in my bedroom, over 30 years on. 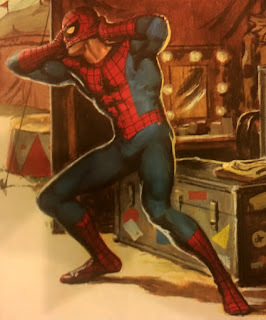 While I've profiled how his Fantastic Four defined the team for me as much as any John Byrne comic could, I missed saying while he was alive how his Spider-Man did the just the same. A task which puts him in the leagues of elite spider-artists such as Ross Andru (who I'm sure he based his take on) and JRJr. While a tale featuring a evil clown and an acrobatic 'boy wonder' are more associated with Gotham, Earl made the adventure come alive with lifelike looking characters set amongst all the colour of the circus. His art in these stories is part of what made me feel Spidey could have been real as a kid (that and he was on the Electric Company)! Nowadays in hindsight, it is amazing that an A-game painter worked on such children's fare. I mean flash forward to now, would Alex Ross do the same? That fact on its own proves the true mark of the man. Wow, amazing panels. Thanks for posting this. I didn't know Norem had died. No worries Tam B - yeah I was quite sad that his passing didnt get more respect too. Glad you liked the post.